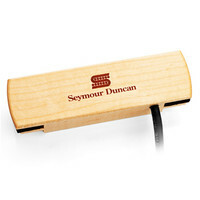 The Seymour Duncan SA-3HC Woody Pickup is a hum canceling pickup that fits unobtrusively in nearly any acoustic guitar soundhole and passively amplifies your sound. This is an easier and more affordable alternative to a microphone amplification setup while providing the same great response and moderate output ideal for strumming and delicate fingerstyle playing. This pickup is instantly mountable and includes a studio-quality 14 cable. It works with any guitar amplifier (preferably an acoustic guitar amplifier) or plugged directly into P.A. systems or mixing consoles. The Seymour Duncan SA-3HC Woody has been used by artists including Joe Quigley (Lisa Loeb) Mike Dennis and Billy White Acre. This entry was posted in Seymour Duncan and tagged Guitar-and-Bass. Bookmark the permalink.